Today my little baby started playschool. I actually can't believe this day has come so soon, he's two next month as well - when did my baby get so grown up and independent?! 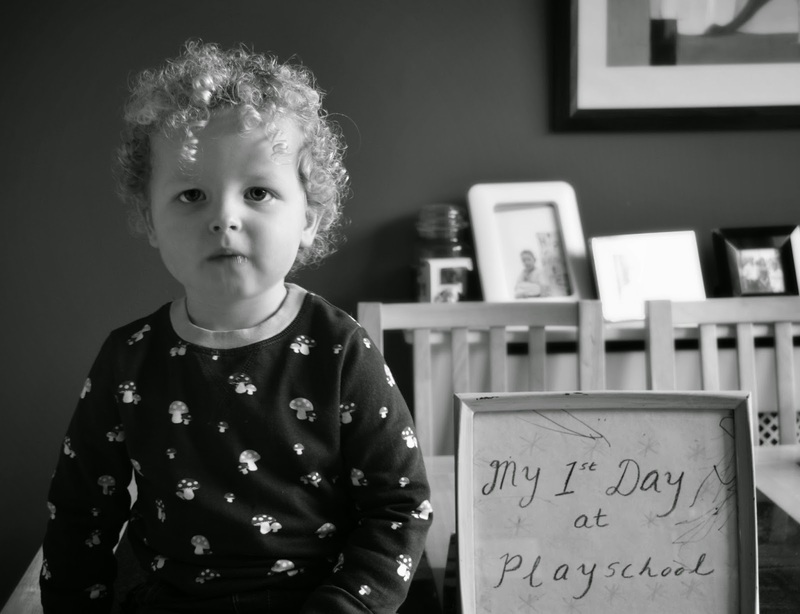 We prepared a little drawing together with "my 1st day at playschool" on it, a few stars and some of Tyler Lee's scribbles on it to mark the occasion, it made a lovely little photo prop too. I only began telling him this morning that he was going and his excitement was unbelievable! I think me telling him that he was going to see the other boys and girls had him totally happy, he loves other people and children, thankfully he's the opposite of his socially awkward mother! He wouldn't nap before going, I honestly think it was from excitement. I gave him his little sack, put it on his back and then he wouldn't take it off. He was running around the house like a loon, he's a hilarious little dote. 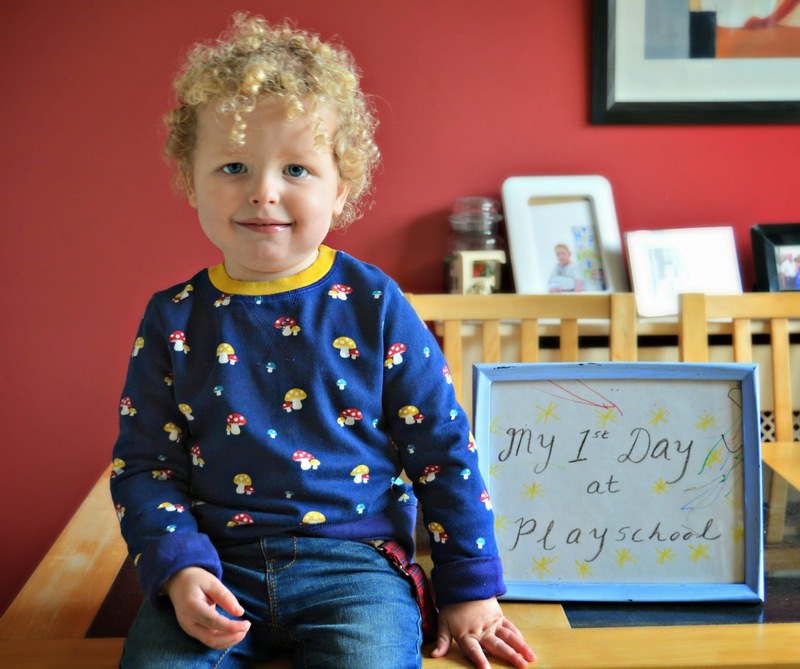 Whilst Tyler Lee was happily looking forward to his first day at playschool I was an anxious, nervous mammy. I have never let my boy with anyone but five members of my family before and with one of those people he was always tucked up in bed. He's never been in close proximity with other children his own age apart from in soft play areas... and God knows how much I despise them. I know, however, that this experience in playschool will do him the world of good. He craves socialisation and is always saying hi to other people and their children when we're out and about, seriously, how did I create such a friendly and outgoing child? I secretly (or not so secretly now!) wish I was as social and open to people as he is. I've also been anxious for Tyler Lee to begin playschool as he isn't saying as many words as I'd have hoped he would at this age. He knows everything I'm asking him to do, says the odd few words and talks to me in his own little language but I think being around other people and children of his own age with really help him along with his speech. He'll also get the chance to do activities which we wouldn't normally do here at home. I know he'll just love it! We dropped Tyler Lee to playschool at two and he ran in the door straight over to the toys. He began playing with blocks and sitting on the little chairs there, things he never does at home - amazing to see him doing these things so freely straight away. These may be such little, everyday things to some of you parents reading but these are huge for me as Tyler Lee is never really interested in sitting down and play with toys unless he's left in his room on his own. The boy has a bee in his bum, he can never stop moving! Tyler Lee then started saying hi and chatting away in his little toddler language to the other children when they came in the door, I was delighted to see him being so friendly and happy. Jacek and I then decided it was safe enough for us to leave so we sloped off leaving our boy relish in his new experience and the first chapter on his road to proper school. When we went to pick him up Tyler Lee was crying but we were told that was only because the other children were being picked up and he didn't understand why they were leaving and not home. We were also told he cried when we left but only for a few minutes and he cried when the school owner came in and left because he thought she was his Nana! We were told that he was happy playing with the toys and teddies, sitting on the little chairs there and he even did some painting, these are now sitting proudly on my fridge. On days like these I am so proud of my boy, he was put out of him comfort zone and into a new world of other children, new people and a new place but he took it in his stride minus a few tears but those are to be expected of a toddler his age. He's back to playschool on Friday morning for longer with more children so I hope it's another positive experience for him and that he loves being there. How do I have a child old enough to be in playschool already?! Time seriously needs to slow down! How exciting! Going to preschool is such a big milestone for the kids. I remember both of my boys first days like it was yesterday. So exciting Robin, I feel like my baby is all grown up! How sweet! I wish time really would slow down too. It doesn't though, so just try to live every second with no regrets! They grow up way too fast! Enjoy all those times in playschool with him! There are many milestones he will hit enjoy them all! Oh wow, I didn't realize that kids went to preschool at age two. That seems so young to me! Then again, I don't have kids, so I"m not sure how a lot of things work. Carmen Perez: Aw, so cute. And yes time definitely flies, enjoy them while they're little! Awww! How exciting! Time flies, before you know it they'll be graduating! Aw how sweet! I remember when my oldest went for the first time. I cried and cried lol! The years fly by so quickly! He's adorable! He's such a cutie! Time certainly flies, I remember when I had a kid in preschool myself. I'm glad that he mostly had a good time. One of my kids bawled the whole first week of preschool! What a cutie pie! He does not look too enthused about going to preschool! I bet he really starts chattering after he gets used to school and makes some friends. He'll probably have a lot to tell you each day! Oh bless him, hope he continues to enjoy his time there!! These kids grow up fast! I feel exactly same way with my baby cousin, urgh!! What a great moment! My son is in school and now LOVES it. It took a while though. Wow he is gorgeous - those little blond curls are too cute! First day of playschool is a big day! I was the same way. No one has watched our son but family, and even then we're selective, lol. And he's 7. ;) Sending him to school that first year was hard!! That is so sweet. I think all children go through that initial stage where they really want to play and and learn but have that shock of 'where's mommy?' It sounds like his school teachers are doing a good job. What a great milestone! I love the paintings - I keep all of my boys' ones, I do wonder where I will put them all! Kids grow up so fast. I love his painting and how you capturing the best moment's of your child's life. Aww, sounds like Tyler Lee enjoyed his first day. I have all this to look forward to when i decide to have a family! He's so adorable! I love his paintings too! The firsts in youngsters life are great. To watch them grow is one of the best parts of life. Thanks for sharing. Aww so wonderful and sweet! I never had a kid - but I am sure I'll be keeping stuff as well if the time comes. Well he sure looks like he did a good job, my little one was not good at playschool, he cried everyday. Looks like he had a great day. I know I was so worried about my little one when he had his first day but he just walked right in and didn't even turn around. It will be a great opportunity for you both. He'll learn to interact with others and you'll learn to take some time for yourself! I just love reading about your son. Each one of your posts reminds me of all the things that happened with my son, Tyler, many years ago. You know that annoying thing everyone says 'it goes by so fast'...they weren't kidding. I love the pictures you shared! Sounds like he had a great first day of playschool.